Between Golspie and Brora is Carn Liath, the Grey Cairn. 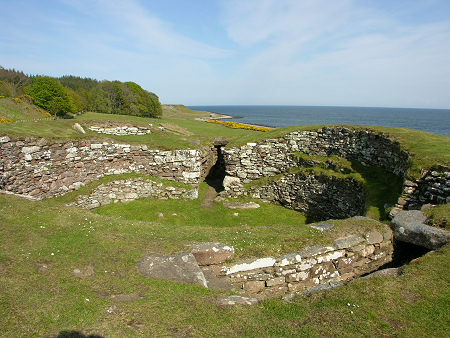 This broch occupies a terrace overlooking the shore, has walls that are still 12ft high in places, and comes complete with a well preserved entrance passage and lintelled doorway. The path is well signposted. It leads down to a relatively safe place to cross the busy A9, to a track to the broch from the far side of the crossing point. Don't try to cross the A9 nearer the broch. The remains of this broch are still impressive. The interior is deeper than the exterior, which remains partially banked. 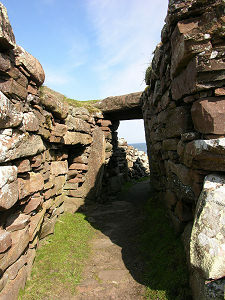 In the entrance passage is a cavity possibly used to guard the broch. 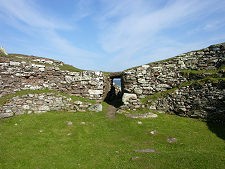 And on the opposite side of the broch from the entrance is a set of steps within the wall. Carn Liath was first excavated in the 1800s by the Duke of Sutherland. As the name implies it was thought at the time to be some sort of burial mound or cairn. But as it was cleared away the broch you see today emerged from the build-up of earth. 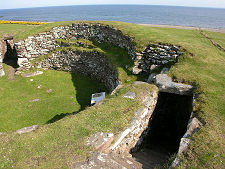 The broch was probably built in the last century BC or first century AD. Opinions differ about the purpose of brochs, and range from resource-hungry status symbols to temporary defensive structures for extended families and their livestock. Around 500 were built in Scotland, including good examples at Broch of Gurness in Orkney, Dun Carloway in the Western Isles and Clickimin Broch near Lerwick in Shetland. The original clearance of the site unearthed a range of pottery pieces and stone and bone implements, plus a silver ornament and an iron knife blade. More recent excavations in 1986 found a bronze age burial on the site, complete with grave goods. 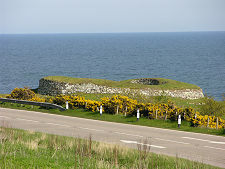 The remains of the broch are surrounded by signs of a small settlement. 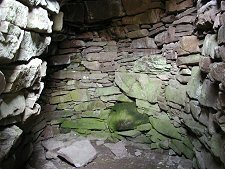 Opinions differ about whether this would have been in use at the same time as the broch itself, like a castle with its surrounding village: or whether it was constructed by the broch-dwellers when they no longer needed the original structure. Excavations have indicated that the surrounding houses might have been in use as late as AD 400.